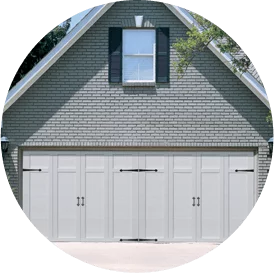 Overhead Door is one of the most recognized and respected brands in the garage door industry. C. G. Johnson invented the upward-lifting garage door in 1921 and the electric garage door opener in 1926. For over 95 years, the Overhead Door brand has stood for product quality and expertise, as well as professional service. From commercial overhead doors to residential garage doors and openers, Overhead Door combines quality, dependable products with reliable service for every single project. Locally, Don Johnson began Overhead Door Co. of Burlington out of his home in 1948, and the company is now in its third generation. It has grown to become one of the largest overhead garage door and electric operator installation companies in Vermont and New Hampshire and one of the largest firms of its kind in northern New England, consistently winning national awards and recognition. In the early 1980s, Don’s son, Jerry Johnson introduced a variety of millwork items to complement the garage door business. Overhead Door Co. of Burlington quickly became the choice of contractors and homeowners for high-quality windows and doors. We have a large well-trained and experienced staff to promptly handle all your needs. 2015 proved to be a busy year for Overhead Door Co. of Burlington. Jerry Johnson retired and Don earned the role of Branch Manager, carrying on the family tradition. Simultaneously, we became part of the Installed Building Products (IBP) family of companies, maintaining our local family run business with the added support of a whole new level of connectivity. The following year, with the support of IBP and New England based and trusted insulation company Builders Installed Products, we launched our own division of BIP to offer state-of-the-art insulation installation for residential and commercial projects. BIP has been providing excellence in customer service since 1981, previously under the name of Builders Insulation. Long known as “Builders” we have a superior reputation for providing the best quality building products. Our promise to you is to provide quality products and installation services on time and on budget, every time.